I think I'm going to give up – for two days now I've been trying to categorize the KTM Super Duke, but I can't. I've been trying to decide whether it is a normal naked bike with a touch of Super Moto, or if it's a Super Moto with a whopping engine. But let's not focus on my dilemma too much and track back how this story all started. The morning was misty in the hills... No scratch that. It was an early morning, but it was at the very unromantic NEC and the event was the bike show. As usual KTM has got a huge stand and the “orangeness” is overwhelming. Amongst their barking mad off-roaders there's something even more barking mad than usual; the KTM 990 Super Duke. This bike has stolen the KTM 950 Adventure's V-twin engine, bored it out and put fuel injection on it. Then the bike grew a chassis that is meant for the road. And now it dribbling and drooling and after blood. At the show I had a quick poke at the bike, took some nice snaps of it and headed off; I knew that riding that bike would be a very difficult dream to fulfill as I can't remember the last time we had a KTM for a test ride. On the other hand, I have experienced KTM's generosity in the form of a very nice session at Mallory Park. I had the pleasure of riding the KTM 625 SMC Super Moto around the track. This bike left a very distinct impression. It felt very exact, very robust. I pointed in a direction and it complied immediately. It also felt a bit large, in other words not as much as a motocross bike, but a bit more mature than that. My only real complaint was, as with all Super Motos so far, the lack of top end power. My mechanical sympathy squirms a bit when going down the straight at full smiles. The single cylinder engine just can't muster enough power on a normal track or even the roads. This is where Nick steps into the picture. This Nick fella is a bit of character, you see his hobby seems to revolve around four distinct points; buy a bike, ride the bike, personalise the bike, sell the bike. Thanks to this pattern, Nick has owned over a hundred bikes (yes, one-zero-zero), the bike he owned the longest was about 18 months. So when I heard that one of the bikes in Nick's garage was the KTM Super Duke I immediately felt sorry for him and I turned into some form of Mr Hyde as I started pestering him for a test ride. I never thought he'd actually budge, but I kept on “asking politely” at every chance I got. After several months he started to soften up and I placed another killing question: “Nick, does this mean I can take the Super Duke out for a spin..?”. I never expected the answer: “Sure”. Said and done! We meet up and I'm greeted by the mean orange looks of the Super Duke. This bike looks like it means business. When I look at it I can't stop thinking that this bike consists of no more than engine, frame and front brakes. The rest is just "stuff that has to be there" As little as possible; but still looking very good. I take a good while to admire the details. 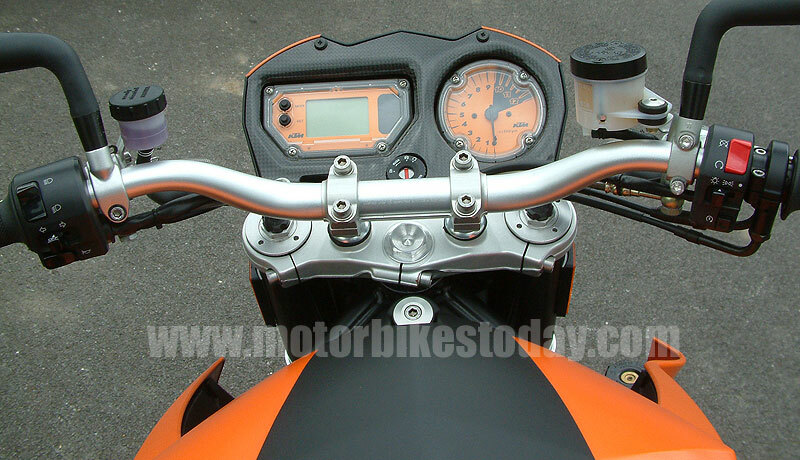 Unlike some bikes, especially italian ones, the KTM lacks that "extra prettiness" in its parts. The KTM is sculpted more like a race bike. Things have a mechanical purpose rather than an aesthetic one, and that's something that speaks a lot to me. 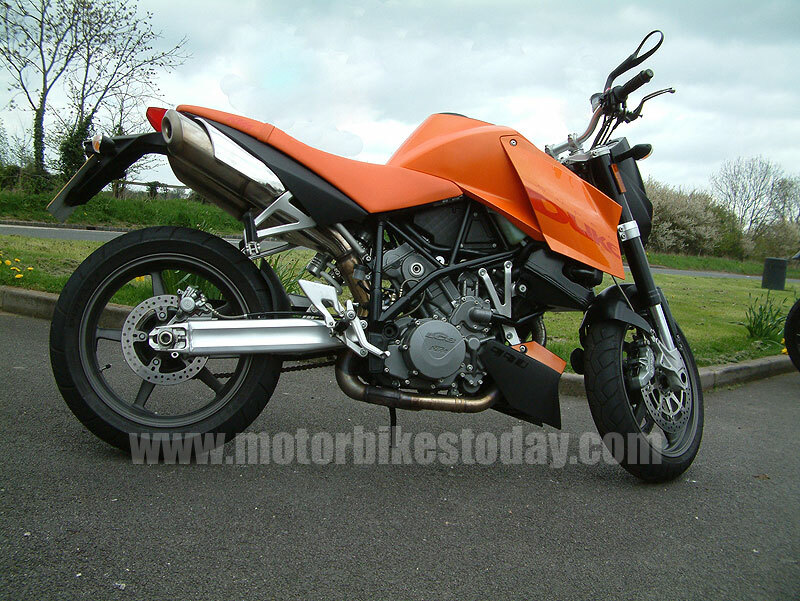 I'm very much for "Form follows function" and the Super Duke is exactly that. The only thing that really bugs me is the design of the tail end. Or should I rather say the aftermath of the legal requirements of the tail. You know, all that stuff that doesn't enhance performance at all, such as lights, indicators and a number plate. But I guess they have to be there. Luckily I won't be looking at them when riding the bike. Eyeballing the whole, it strikes me that the engine is mounted very low in the frame and that the front wheel has brakes that wouldn't be out of place on a bike with 50kg more weight and 50bhp more power. I'm now itching to ride it. Fire the engine up and you're greeted with precise vibrations. Not sloppy ones you might find "characteristic" on certain American produced cast-iron products, but exact and mechanical V-Twin vibrations. I sense that the engineers have put minimal effort into silencing the nature of the engine. This one is built with a purpose, and it ain't "feeling". At this point I'm expecting a race engine, but to my surprise the engine settles into a calm idle and when I play with the throttle it picks up with an eager kind of "can we get going already..?!" Not as barking mad as I thought. Climb aboard and the bike just disappears from underneath you, crikey this one is small. Even the clocks almost disappear from your view. Pulling away in first gear the bike behaves like most well mannered bike. No jerkiness, no hiccups, just straight forward easy to control power. The gearbox is what I expected; precise and exact but no match to Japanese perfection. I increase the speed and the revs, and again to my surprise the engine behaves in a very different manner; I was expecting a moody-race-like V-Twin. Instead I'm served with an engine which doesn't really accept the mechanical fact of only having two cylinders. The engine delivers linear power and revs happily. Very nice. The vibrations are there at all times, they tell me exactly what the engine is doing, but not in a way that takes my focus way from the road. More the opposite; The suspension provides information about the road, and the vibrations about what the engine is up to. Another thing that I immediately feel is a total Deja Vu from the bike I rode at Mallory Park. The way the chassis behaves is exactly the same. I could tell in an instant that these two bikes came from the same shop. It feels very rigid, quite substantial, but very agile at the same time. The suspension seems very compliant and gives ample feedback. I quickly realize that I won't have a faintest chance to test this bike to its limits on the road. I'd need a proper track and several hours to get close to the limit. But back to the roads; The Super Duke tackles roundabouts with ease and we both dream about provoking the rear wheel into a slide, but it's not my bike so we play nice. Overtaking is a breeze with the big engine, as are speeds in well excess of a ton. Pull away from stand still with a bit of eager-throttle the bike calmly lifts the front wheel up. There's power if you want it. 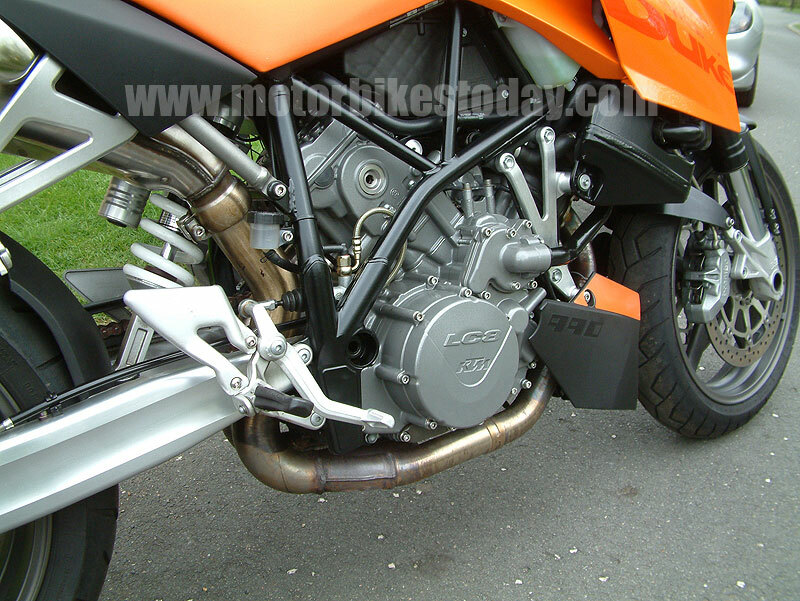 This engine really is a peach and it suits this bike to a tee. Having ridden many bikes with Brembo brakes before, it's no surprise to me that these brakes are up there with the best brakes I've ever felt on a standard bike. There's something special with the Brembos; Just put your fingers on the brake lever and the brakes immediately tells you "Don't worry - I'm here, we'll slow down. I promise". They inspire so much confidence that it's a true pleasure to use them. I bet this might be one of the easiest bikes to do stoppies on. Sadly my ride ends too quickly and I'm left pondering what exactly I've been riding. In some situations the Super Duke feels like a "normal bike" that has been stripped off its excess, such as fairings. 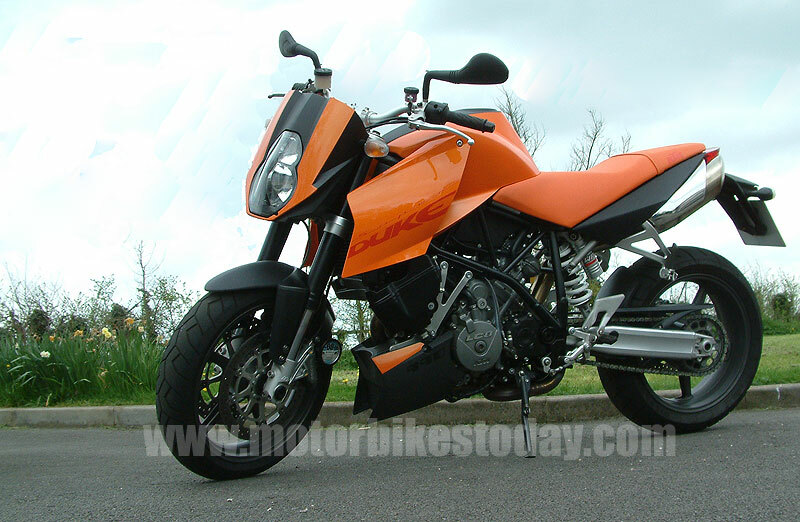 On the other hand the Super Duke feels very similar to the "smaller" KTM Super Motos. I've been trying to figure this out for a few days now, and I think I'll give up. The fact remains: This is a fantastic bike to ride. It handles well, you can take liberties you wouldn't take on a fully faired sports bike. It's got plenty of power to keep up with your friends on sports bikes. The brakes are fantastic and the whole bike just begs to be ridden enthusiastically. Sure I could complain about the vibrations on long journeys and the lack of luggage and pillion space - but if I did that, I would have completely forgotten what this bike is all about. You don't buy this bike to riding across Europe, or chauffeur you girlfriend around. No, no, you buy this bike go out there hunting for Super Bike prey on your favourite twisty roads. And trust me, catching them won't be difficult. Considering this it doesn't really matter what category the bike fits in. A huge thanks to Nick for letting me ride his bike. In fact, his bike is for sale at Hughenden M40. Why's he selling you ask? The reason he gave "I need to clear some space in the garage". Here's your chance own a wonderfully different bike.